The Gandhi family had made money from every defence deal till 2014, Patra alleged, claiming that Rahul Gandhi has not been able to come out of that mindset. Rahul Gandhi's brother-in-law Robert Vadra did not get his share in the Rafale deal and therefore the UPA government cancelled it, he claimed. Rejecting Rahul Gandhi's allegation of corruption against Prime Minister Narendra Modi in the Rafale deal, the BJP on Thursday accused the Congress chief of "lying through his teeth shamelessly" and indulging in "politics of misinformation" to build his political career. 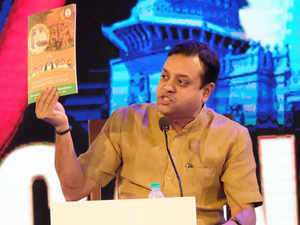 Repeatedly calling Gandhi a "clown prince", the BJP spokesperson Sambit Patra at a press conference also alleged the Congress leader comes from "a family of middlemen" and his his father and former prime minister Rajiv Gandhi was "officially a middleman" in a defence deal. Patra was talking to journalists hours after the Congress president addressed a press conference where he demanded an investigation into prime minister Modi's role in the Rafale deal, alleging that he was a "corrupt man" who helped Anil Ambani pocket Rs 30,000 crore in the purchase of 36 aircraft. Rejecting the allegations, Patra said the BJP stands with the truth and accused Gandhi of making a mockery of national security. He also said the Indian Air Force Chief has recently described the purchase of the fighter aircraft as a "game-changer". Patra also read out from a statement of Dassault Aviation, manufacturer of Rafale fighter aircraft, to claim that Gandhi inserted "Reliance" deliberately where the firm has spoken about its commitment to offset purchase from India. The BJP leader further said the Supreme Court has also dismissed a PIL (public interest litigation) that had questioned the aircraft's price and sought the deal cancelled. He said the people will decide whether to believe Gandhi or the Supreme Court and the Air Force Chief. "People of this country do not want a clown prince to play with the national security. His press conference was full of lies and deception which he is using to build his political career. This will not happen," he said. Reacting sharply to the Congress president's allegation that Modi acted like a "chowkidar" of Anil Ambani, the BJP leader asked whether former prime minister Rajiv Gandhi was a prime minister only for Ottavio Quattrocchi, an accused in the Bofors case. Patra accused the Congress leader of "lying through his teeth shamelessly" in wrongly quoting former French president Francois Hollande as referring Modi as corrupt. Gandhi had earlier also quoted French president Emmanuel Macron as having told him that the aircraft's pricing was not part of the secrecy clause, and the French government later denied it, Patra said. "He (Gandhi) still has the audacity to hold a press conference and lie through his teeth. This is shamelessness," the BJP spokesperson said. The Congress-led UPA government had jeopardised the country's defence as the squadron strength of the Air Force fell to 31 from 44, he alleged. On Gandhi's charge that Defence Minister Nirmala Sitharaman's trip to France was part a government cover-up, Patra said her ministry has already clarified that the visit was scheduled earlier.